window10 की critical error को कैसे दूर करे ? 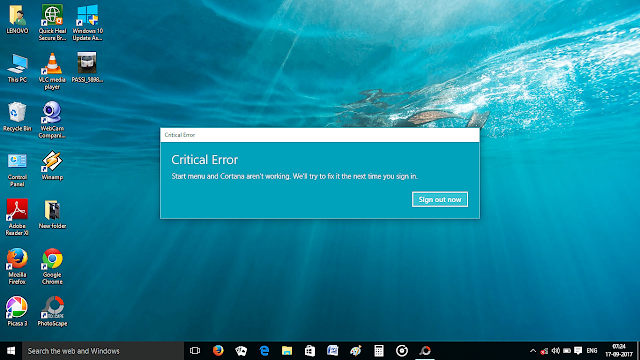 Hello friends ,aaj aap meri es post k jria jane k kese critical error ko door krna h .kbi kbi aesa hota h ki laptop ya pc on krte hi hmare samne critical error ka box samne aane lagta h .jis k karan hm apna work nhi kr pa rhe hote h.To chlte h jante h ki ye critical error kya h or kese ese solve kr skte h.
Dosto kai baar window 10 start krne pr ye line likhi aati h “start menu and cortana are’nt working.we will try to fix it the next time you sign in”.es error k karan hm apne laptop ya pc pr work nhi kr pate h.
Mere pc m bhi ek baar yhi problem ho gai thi tb mujhe kafi preshani hui ese solve krene m.aaj hm apke sath whi solution share krne ja rhe h jo mene use kiya tha .Aap niche btae anusaar step by step follow kro umeed h aapki ye critical error ki problem door krne m meri post helpful rhegi.wese to critical error window 10 ko door krne k or bhi bhut s methods h pr mene jo method use kr k es error ko door kiya tha wo apko bta rhe h .
Read more: Window10 ko kese activate kre? 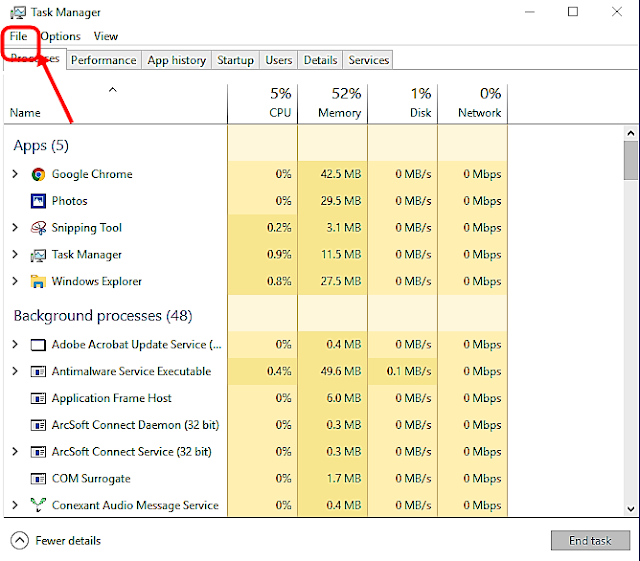 1).sb s phele aap apne pc/laptop k search m ja k type kijea Task Manager.aap k samne task manager ka box open ho jaega jo niche btae image jese hoga. Apko first option pr yani Run New Task pr click krna h.
ab apke samne run new task ka box open ho jaega . 3).es box m apko niche image k according three kaam krne hoge. 2).niche k check box ko click krna h.
3). ok k button pr click krna h.
a).first apko Boot option pr click krna hoga. b). Boot option m ja k Safe Boot pr click krna h .
c).Apply pr click krna h.
d).ok button pr click krna h.
5). Ab apke samne ek new box open hoga es m apko Restart k button pr click krna h.
Read more: debit card और credit card में क्या अंतर हैं ? Rupay card kya hota h?eske kya fayde h? 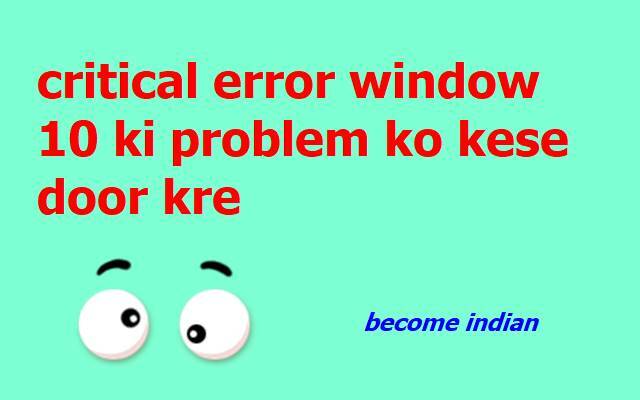 Run New Task pr click krna h or system configuration ka box open krna h.
ab apne phele jo Boot option m jake Safe Boot ko click kiya tha use waps uncheck krna h .or OK button p click krna h.
umeed h apki critical error window 10 ki ye problem solve krne m meri post helpful hogi . aapko meri ye post kesi lgi comment box m likh k jror btae.apki help k lia meri post aati rehgi jo apke lia helpful hogi .post acchi lgi ho to apne dosto ke sath share jrur kre.